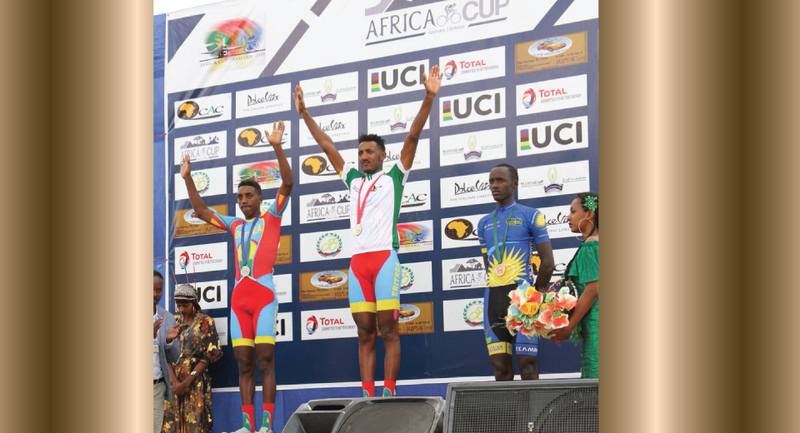 the ‘Criterium Stage’ of the African Cycling Cup 2018 competition, Eritrea won both Gold Medals for elite/under 23 Men’s competition South Africa and Ethiopia snatched Gold Medals for elite/under 23 Women’s Competition respectively. The ‘Criterium Stage’ conducted in the morning hours of today, 24 November covered 34.4km. According to report, at the Women’s Elite competition, Sanet Coetzee member of the South African national team won Gold while Tsega Gebru member of the Ethiopian national team and Margesjka Matthee member of the South African national team are forced to settle for Silver and Bronze medals respectively. From Women’s under 23 competition, Eden Bekele from Ethiopian national team won Gold, Znab Ftsum and Diana Dawit both members of Eritrean national team settled for Silver and Bronze respectively. From the Elite Men category, Sirak Tesfom from the Eritrean national team won Gold, and Henok Mulubrhan from Eritrea Silver, and Samuel Mugisha from Rwandan national team won bronze medal. In Men’s under 23 category, Henok Mulubrhan from Eritrean national team, Samuel Mugisha from Rwandan national team and Redwan Salih from the Ethiopian national team won the Gold, Silver and Bronze medals respectively. From the three stages competition, the Eritrean national team won a total of 8 Gold Medals, 4 Silver, and 2 Bronze. Ethiopia has won 1Gold, 4 Silver, 3 Bronze; and South Africa 1 Gold and 3 Silver and Rwanda 2 Silver and 2 Bronze Medals. The final stage of the African Cycling Cup 2018 which is the first of its kind will be conducted tomorrow, Sunday 25 November. Eri-TV will live broadcast the final stage of the competition.